This week in the war, on 11 November 1943, the resistance fighters of the Maquis in the Ain department of the Rhone-Alpes region of France occupied the town of Oyonnax for a few hours. To commemorate the Armistice of 1918, they marched to the war memorial and laid a wreath of flowers in the form of the Cross of Lorraine—the symbol of Free France and the struggle for liberation from the Nazi occupiers. The inscription on the wreath read: Les vainqueurs de demain à ceux de 14–18 (From the conquerors of tomorrow to those of 14–18). Before leaving, the members of the Maquis joined with the townsfolk in singing the Marseillaise. 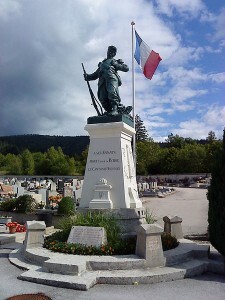 This entry was posted in World War II and tagged Armistice Day, maquis, Oyonnax, Remembrance Day. Bookmark the permalink.